In this Sept. 1, 2018 photo, the windows are boarded up on artist Robert Indiana's historic "Star of Hope" home on Main Street in Vinalhaven, Maine. Indiana died on May 19 in the house, which had a hole in the roof and pigeons living inside. But testimony in probate court showed that he had plenty of money even as his home fell into disrepair around him. Two pieces of artwork belonging to the late artist Robert Indiana will be auctioned off by his estate next week in hopes of providing future funds for the ongoing legal fight surrounding the estate and the crumbling home Indiana left behind. Indiana, the renowned pop-artist known for his iconic “Love” series, died in May at his Vinalhaven home, known as the “Star of Hope,” where he lived since the late 1970s. He was 89. In the six months since his death, a legal battle has surrounded the estate he left behind. On one front, the executor of his estate, Rockland-based attorney James Brannan, has launched a wide effort to locate artwork that belonged to Indiana, and therefore his estate. On the other front, Indiana’s estate is contesting a lawsuit filed in New York the day before Indiana died. The suit alleges that in the years before his death, two of Indiana’s associates isolated the artist and produced fraudulent artwork under his name. As the legal fees add up, especially in contesting the New York lawsuit, Brannan said he needed to make a tough decision on whether to sell artwork belonging to the estate. Brannan declined to say how much the legal fees have cost the estate, which is valued close to $70 million, he said. The majority of the assets are artworks Indiana produced or collected. Additionally, last week, the non-profit organization, Maine Preservation, added the Star of Hope to its 2018 list of endangered historic places. The building needs significant repairs to become a museum, as Indiana instructed in his will. On Nov. 16, the two pieces of art gifted to Indiana will be auctioned off in New York. The artworks are by Ed Rushca and Ellsworth Kelly. Together the pieces are valued at up to $4 million, Brannan said. The New York Times reported this week that former friends of Indiana oppose the sale of the artworks, especially the sale of the Kelly piece, because the two artists once shared a romantic relationship. However, to these concerns, Brannan says the estate still has 14 pieces of artwork by Kelly, including 12 that are of Indiana specifically. Brannan said with this collection, when the Star of Hope becomes a museum, the connection between the two artists will be represented. In budgeting for 2019, Brannan said it became clear that the estate needed more funds as the New York lawsuit enters the discovery phase and “legal fees are escalating quickly.” The litigation in that case is expected to go into 2020, Brannan said. Brannan said there will likely be more probate hearings in Rockland in an attempt to collect items from galleries he believes belong to the estate, but he does not expect that to take as long to reach a conclusion as the lawsuit likely will. Any artworks by Indiana would be the last thing sold if the estate lost in litigation and was ordered to pay, Brannan said. 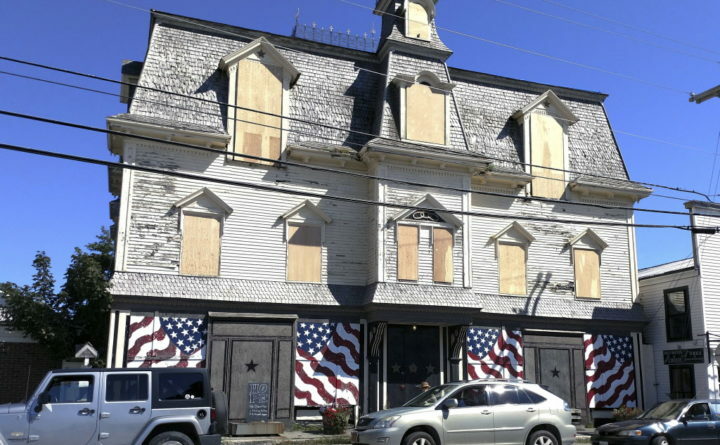 While the litigation plays out on the mainland, the Star of Hope sits boarded up in the heart of Vinalhaven, deteriorating. In its designation last week, Maine Preservation urged that parties involved with the administration of the estate ensure that the pending legal action does not cause further deterioration of the building. “If nothing is done in the short term, significant exterior and interior features of the Star of Hope will be lost,” according to the organization’s website. After having an architect asses the building, Brannan said stopping water from entering the structure has been deemed a priority. Work was supposed to begin last month to repair a hole in the roof, but was delayed because the contractor was not able to get the equipment needed. Within the next few weeks, the roof will be repaired and the building will be “buttoned right up for winter,” Brannan said. Over 90 percent of the items in the home have been removed and archived, Brannan said. By next week it will be completely empty. It will cost millions to turn the building into a museum, as reported by the Associated Press. Which is why Brannan is trying to be frugal now with any short term repairs that are made. However, before Indiana’s vision of his home being made into a museum is brought to life, the litigation surrounding his estate needs to come to a conclusion.